Hoyt Arboretum is one of my favorite places, it’s like an amusement park for nature lovers. A person can walk through a grove of Spanish Chestnut trees, then a section of Elm and through a mini Spruce forest within a matter of minutes and that’s just a smidgen of the collection. Some days I go there to hike and sometimes I go there to saunter from one scenic bench to another, usually stopping for a nap at one of the meadows. Yesterday I snoozed under the Common Persimmons. It’s the worst meadow to nap in, poky grass with lots of blackberries coming through. But it’s a secluded part of the park and the Japanese Wingnut trees are some of my favorites with their graceful draping lines. It was a hot cloudless day yesterday and I heard something like rain as I approached the trees. I walked up to the boughs and watched little bits fall through the branches. Small and quick it was only from seeing all the blossoms on the ground that I could confirm that flowers were falling through the tree, each bouncing off leaves in its decent like a pin ball. I held out my hands to see if I could catch one and got pelted on the cheek instead. 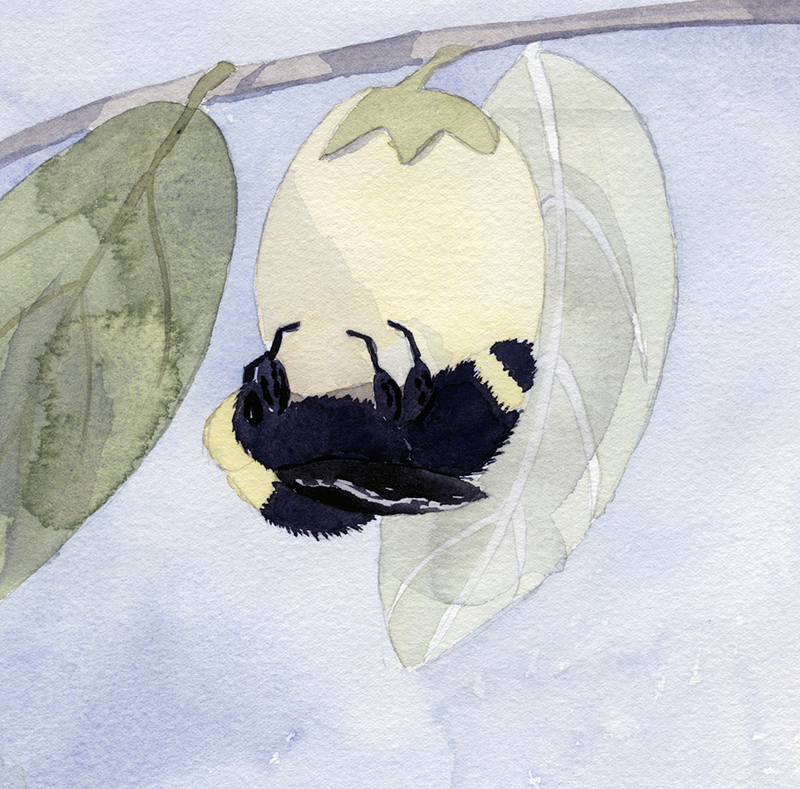 The tree was completely inhabited by bumble bees, buzzing from one bell shaped flower to another. My intrigue with the sound of flowers apparently granted me a super power to walk into a dense bee zone without fear. The Yellow-faced Bumble Bees didn’t seem bothered by me and it was magical to be surrounded by their buzzing, dedicated presence. 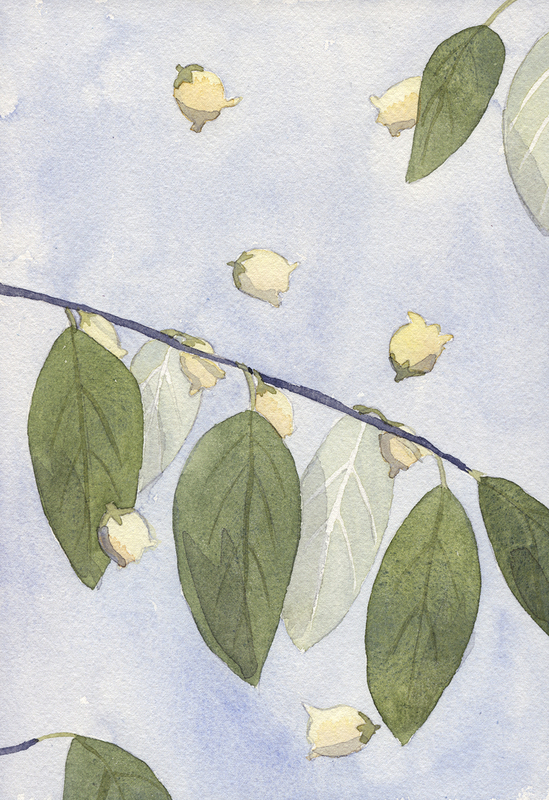 I stayed and watched the petals fall before I threw a blanket down next to the tree to rest. I love the sound of rain, persimmon flowers have a similar cadence but a dry and woody timbre. I have spent many hours of my life in this park and still there are new and wondrous things. 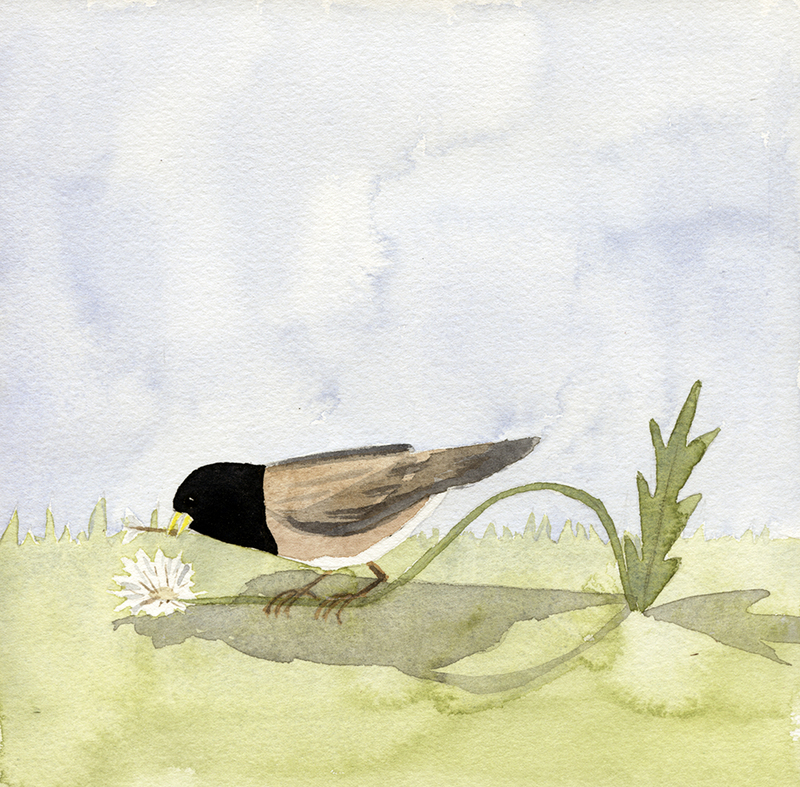 Once I watched an Oregon Junco hop up on a dandelion stem and pin the head to the ground to eat the seeds. That was back when juncos, robins and jays were the only birds I could name. If I were to make a screen play of my life that moment would be the ominous foreshadowing where my character’s fate veered in a new direction. Later we’d see her buying a pair of binoculars and staring into shrubs with folks who name drop bird species and birding hotspots like they were celebrities. Today I’m on a different mission. I’m wandering around trying to decide which trees to paint, fretting about how my latest body of work is not exactly coming together. A Red-tailed Hawk flies up the trail I’m on as if it was made to provide hawks passage through the woods. It lands on a branch that arcs over the path and considers whatever hawks consider when they decide to perch. So this is where I will paint today, not that the hawk is going to stay and model for me. I can add it into the scene, satisfied that I captured something that happened, something that could happen on anyone’s walk here. There are many birds I never saw before I went birding. Once introduced to a new bird on an outing with competent birders I begin to see the bird as if it magically just moved into the neighborhood. There are so many more birds in my world than their used to be and it is just from a little study, a little preparation. I find a spot off the trail and set-up to paint. I have one of the miraculous moments while I am drawing where I can focus on what I am actually seeing in a lighthearted way. No laboring of exactness, no making stuff up out of impatience. It is so delightful! My leaves look like maple leaves! What magic! 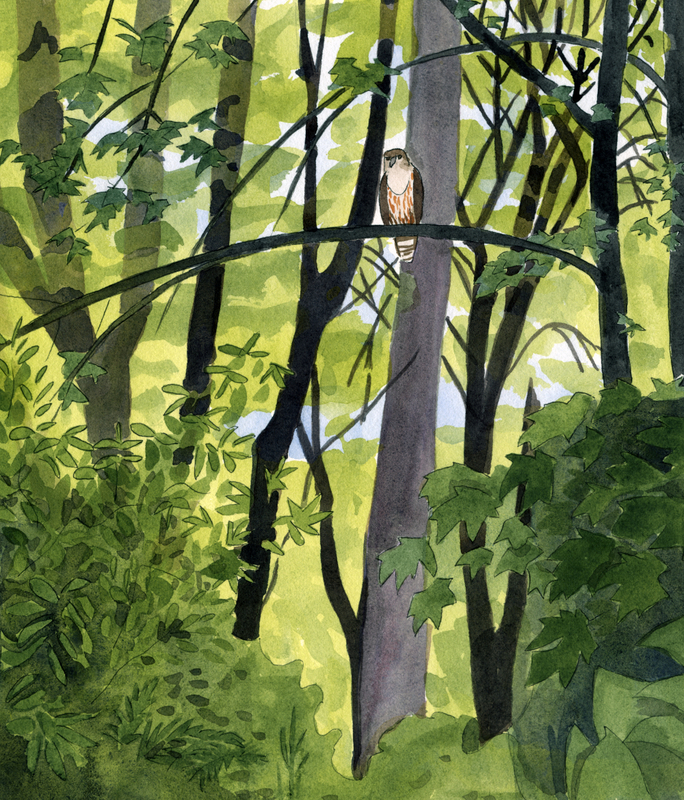 I will nearly ruin the painting in the studio later but the moment, sitting in the grass under the Smoke Tree trying to sort out the infinite greens of the forest to frame the perch of a common but majestic hawk is worth it and may provide ominous foreshadowing of its own.